This wine has a nice, bold black label. It looks like it means business, there’s a dragon on a mountain, that’s as rugged as it gets. The wine has a screwcap, perfectly sensible for a white wine intended to be drunk young. Yet the screwcap top is silver, and the label is black with gold embossed picture and red dragon with white print. It’s all very confusing, as though the label was developed in one country and the top in another. As this wine is made from grapes grow in Romania then vinified and blended by Australian I feared the wine itself would be an awful jumble of ill thought through ideas thrown together at the last minute by a committee. 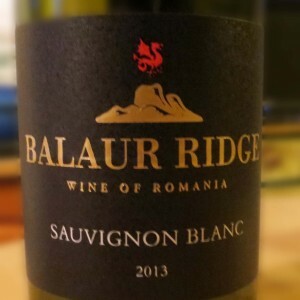 Balaur Ridge Sauvignon Blanc 2013 from Virgin Wines is therefore best served in a cooling jacket, not just because it’s nicer colder, but also so you don’t have to get upset by the terrible design choices. It’s a pale lemon colour, and looks better out of the bottle. It smells good, with the a grapefruity citrus aroma dominating a fruity combination. It’s just off dry, with a medium acidity and only just a medium alcohol level. It’s quite light bodied. All together middle of the road and not super obviously a Sauvignon Blanc on first sip. Balaur Ridge tastes much better than the design looks. It’s grapefruity, but it also tastes of Fruit Salad sweets, and I’ve always loved those. There’s a tanginess that isn’t quite gooseberries, but it’s working on it. The wine is far more together than the design concept and isn’t a bad intro to Sauvignon Blanc for people who haven’t ventured far from Pinot Grigio.